Miles’ passion for the agriculture industry and his drive to see his customers succeed launched him to start his independent consultant career in 2006, after almost 20 years in the Ag Retail business. He grew up on a farm near Belmont, MB and moved to Brandon where he received a Diploma in Agribusiness. Miles has 2 sons who keep him busy. He enjoys curling, whether he is curling himself, or coaching his son. Miles also loves the NFL, roots for the Dallas Cowboys, and is a general sports trivia buff. 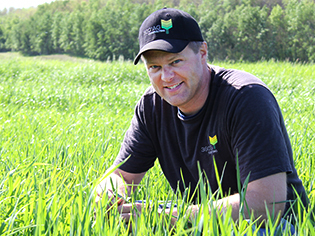 360º Ag Consulting, based in Roblin, Manitoba, operates throughout Saskatchewan and Manitoba as a precision agriculture and variable rate fertility service. Our superior agronomic knowledge gives our farmers advantage through field crop scouting including weed and disease scouting, geo-referenced soil testing, seed production scouting and manure management.